Veteran party leader and former chief minister V S Achutanandan urged the party leadership to join hands with secular forces to fight the Sangh Parivar. Thiruvananthapuram: The ruling CPI(M) in Kerala said today that the party's defeat in the assembly election in Tripura should be viewed with utmost seriousness. "The country is facing serious challenges. The Congress, which had ruled for decades in the post-independence period, has become weaker now," the 94-year-old Marxist veteran said in a statement in Thiruvananthapuram. 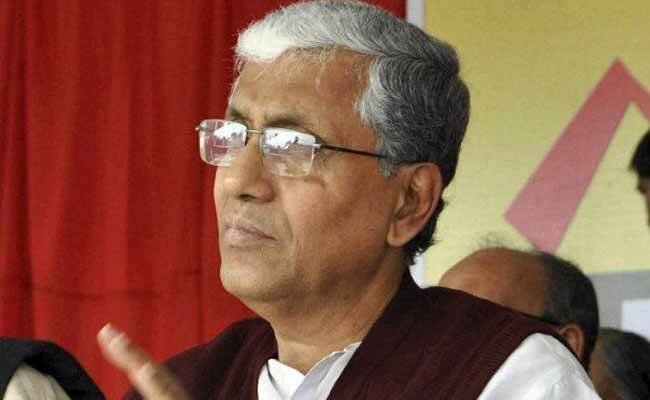 The Left parties, which ruled West Bengal and Tripura, were also "weak," Achutanandan, who supported the party General Secretary Sitaram Yechury's line of having an understanding with Congress to fight the BJP, said. Senior party leader and state minister A K Balan alleged that the saffron party had "misused" money and power at the Centre for their victory in the northeastern state, which was considered as the fortress of the Left party. BJP's victory was a challenge to the democracy and the national integrity, Mr Balan told reporters at Kasaragod district. Senior CPI(M) leader, M V Jayarajan said in a Facebook post that the BJP's victory in Tripura was the result of money power and the "unholy alliance with terror groups." Mr Jayarajan, who is also the private secretary of Chief Minister Pinarayi Vijayan, alleged that the Congress leaders and its cadres had moved towards BJP. However, CPI(M) state secretary Kodiyeri Balakrishnan is yet to react on the poll results of Tripura, where the CPI(M)-led Left was unseated after 25 years of rule.